It is different for every item. Bulk Lot of 25 WHITE/GRAY 3.5mm Headphones / Earbuds. Enhanced sound quality, outstanding bass and treble clarity. So, I ask that you look at the photos carefully before buying. It is different for every item. Bulk Wholesale Lot of 25 Black Earbuds / Headphones - Individually SEALED - 46". Each earbud is individually wrapped and sealed. For use with Smartphone, iPhone, iPod, MP3 player, Tablet and other devices with a 3.5mm audio plug (standard). It is different for every item. Lightweight and Stylish design. Cable Length : Approx. Bulk Wholesale Lot of 100 Black Earbuds / Headphones - Individually SEALED - 46"
It is different for every item. Bulk Wholesale Lot of 100 Black Earbuds - Individually Wrapped - 46" Length. Each earbud is individually wrapped and sealed. For use with Smartphone, iPhone, iPod, MP3 player, Tablet and other devices with a 3.5mm audio plug (standard). 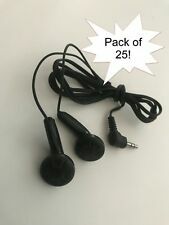 BULK Lot of 25 BLACK 3.5mm Headphones / Earbuds / Earphones - Great for Schools! It is different for every item. Enhanced sound quality, great bass and treble clarity. So, I ask that you look at the photos carefully before buying. Cable Length : Approx. Bluetooth Workinbuds Green. Original Workinbuds Green/Blue Silicone. 1 Workinbuds earphones. Earplug Headphones With Wireless Adapter Bundle. Bluetooth AUX 3.5mm Jack Hands free Bluetooth Adapter. Type Bluetooth Audio Receiver. It is different for every item. Enhanced sound quality, outstanding bass and treble clarity. So, I ask that you look at the photos carefully before buying. Lightweight and Stylish design. PICTURES ARE EXACT ITEM BEING SOLD. Color: Red with Silver Accents. Single Unit. Color: Black with Silver Accents. Single Unit. MAXELL 190317 Stereo Headbuds. For all portable stereos, boom boxes, MP3 players & CD players. In-ear stereo headphones. These have great sound quality at a great price! What more could I ask?. The product has an excellent fit, excellent price, and excellent sound. ~We aim to provide you with 5-Star service! It is different for every item. 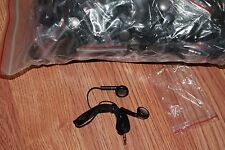 Bulk Wholesale Lot of 50 Black Earbuds / Headphones - Individually SEALED - 46". Each earbud is individually wrapped and sealed. For use with Smartphone, iPhone, iPod, MP3 player, Tablet and other devices with a 3.5mm audio plug (standard). It is different for every item. Lot of 50 - Pink / White - 3.5mm In-Ear Earbuds. Compatible with Apple iPhone 4, 5, 6 & 6 , Samsung Galaxy, S5, S6, Note, etc. Lightweight and Stylish design. Cable Length : Approx. It is different for every item. Lot of 100 - Blue / White - 3.5mm In-Ear Earbuds. Lightweight and Stylish design. Cable Length : Approx. It is different for every item. Cable Length : 6' Foot Long. So buy with. So, I ask that you look at the photos carefully before buying. Lot of 40 New Earbuds. Mix of Black & White. (mostly black). It is different for every item. BULK Lot of 50 BLACK/SILVER 3.5mm In Ear Earbuds w/ Mic. Each earbuds has a MIC built in! Lightweight and Stylish design. 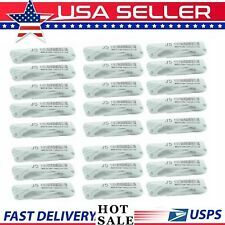 (Need a larger quantity than listed?. ). KOSS 175481 KE5 Earbuds (Black). Ultra-lightweight earbuds. 4-ft straight, dual-entry cord. User Review Lot of (2). L-shaped plug provides flexibility & reliability for active use. Product Features. 3.5mm audio jack plug. For use with Smartphone, iPhone, iPod, MP3 player, Tablet and other devices with a 3.5mm audio plug. Color: Black. Color (Generic): Black. General Information. Trending at $25.52eBay determines this price through a machine learned model of the product's sale prices within the last 90 days. Stay active and comfortable with these Wireless Bluetooth Sport Earbuds. Listen to music and take calls without having to pull out your cell phone or Bluetooth-enabled device. Run them behind your neck and never deal with tangled wires again! THE ONE PRICE BUYS 5 NEW PAIRS. INDIVIDUALLY SEALED AVID MODEL AE215 DISPOSABLE BLACK EARBUDS. Works With Most Audio Devices, Such as Apple IPads IPods IPhones Cell Phones MP3 Players Music Devices. Inexpensive Option to Give to Kids to Use With Their Tablets and Church Hearing Assistance Systems. You may have been on a trip when your earbuds got a short in the wire or stopped working altogether. Earbuds are so small; in fact, some are even wireless, which means that losing them is entirely possible. 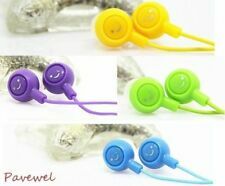 To make sure that you always have earbuds on hand when you want to listen to music or watch a video on your mobile device, purchasing a pack of earbuds in bulk on eBay is a great solution. What is the benefit of purchasing bulk earbuds? When you purchase earbuds in bulk, they tend to be more economical, which means that you can have several pairs in use at once. In addition, if you purchase bulk earbuds for school, you can have a set designated for different things, so that you never leave your earbuds at home. If your earbud tips begin to wear, you will always have a replacement on hand that you can use as well. What are some brands of earbuds available for bulk purchase? Are bulk earbuds with a microphone available? Yes, there are earbuds with a microphone that you can purchase on eBay in bulk. These earbuds may not have the most precise audio quality, but they will be perfectly fine for making a phone call or chatting with a friend on Skype. 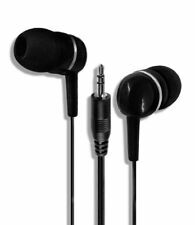 If you are looking into a microphone, you may want to consider looking for bulk earbuds with a case so that you have a place to store them in your bag while you are not using them. What are some reasons to get bulk disposable earbuds? There are several reasons that people consider disposable earbuds over more expensive options. Imagine using the same pair of earbuds every day at the gym. When you work out, you sweat, and that sweat will get on your earbuds if you are listening to music at the same time. 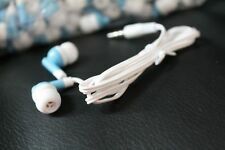 Having a disposable pair means that you can toss them in the garbage when the earbud tips become too wet to wear without feeling that you are wasting money because you purchased the earphones at affordable prices. You can check on eBay to meet your need for bulk earbuds.